No, Time’s only a kind of dream, Kay. If it wasn’t, it would have to destroy everything – the whole universe – and then remake it again every tenth of a second. But Time doesn’t destroy anything. It merely moves us on – in this life – from one peephole to the next . . . [N]ow, at this moment, or any moment, we’re only a cross-section of our real selves. What we really are is the whole stretch of ourselves, all our time, and when we come to the end of this life, all those selves, all our time, will be us – the real you, the real me. And then perhaps we’ll find ourselves in another time, which is only another kind of dream. When the third act begins, Kay awakens from a dream that turns out to be a vision of her family’s future – what we have just seen in act two. With that image hovering over her, she watches her family in terror: her mother, who will lose her fortune; Alan, who will be stalled in the life of a petty clerk, like a Chekhov character (and who is probably gay); Robin, who will make nothing of himself and more or less abandon his wife and children; Madge, a socialist who will end up bitterly alone, working as a schoolteacher; Hazel, whose marriage to a wealthy man will be an unending misery; and especially Carol, who will die a year later. Kay, an aspiring novelist who will become a journalist, linked for years to a married man in a fruitless romance, can’t quite remember Alan’s words of comfort from two decades in the future but he has a sudden intimation that eventually he will know something that can help her. And that’s how the play ends. I’m not a fan of An Inspector Calls but I found Time and the Conways intriguing and affecting. It’s a little like the third act of Our Town (which was written the same year), a little like Kate Atkinson’s stunning novel Life After Life, and Dunne’s theory, at least as Priestley has dramatized it, has shown up in one form or another in various sci-fi narratives, like Vonnegut’s Slaughterhouse-Five, where time is a river and the islands it flows past represent simultaneous lives. Taichman’s production is a decidedly mixed bag. She doesn’t quite get the high-comic style of the first act and she presses too hard on the second, so it comes across as melodrama. Whose idea was it to symbolize the anguish of Mrs. Conway (Elizabeth McGovern) and the psychic dilapidation of Robin (Matthew James Thomas) by making up their faces in act two so they look like they’re molting? The ensemble is inconsistent. McGovern is fine in the 1919 sections but in act two she can’t find the right balance of realism and high style. She’s surrounded by young actors, most of whom I didn’t recognize; the best of them are Charlotte Parry as Kay, a gawky beauty who’s reminiscent of the young Juliet Stevenson, and Gabriel Ebert as Alan, who is both philosophical and whimsical and who, in act two, deflects his family’s disappointment in him with tender bemusement. Alfredo Narciso does well as Gerald, who winds up as Mrs. Conway’s solicitor but who, we only learn late in the play, might have rescued both Madge and himself if he had only followed up on his affection for her. (One of the bonuses of Priestley’s narrative strategy is that the extension of the 1919 section in act three provides us with nuggets of psychological information about the characters, little surprises that weren’t offered to us in act one.) Brooke Bloom as Madge, Steven Boyer as Ernest (who marries Hazel, apparently to exact revenge on all of them for snubbing him as a young man from the middle class) and Matthew James Thomas are less successful. Anna Camp as Hazel and Cara Ricketts as Joan (a friend of the Conway daughters, whom Robin winds up marrying) are inconsistent, maddeningly so in Ricketts’s case. Anna Baryshnikov, as Carol, has the most touching moment in the play, though it’s the set designer, Neil Patel, who really makes it work. 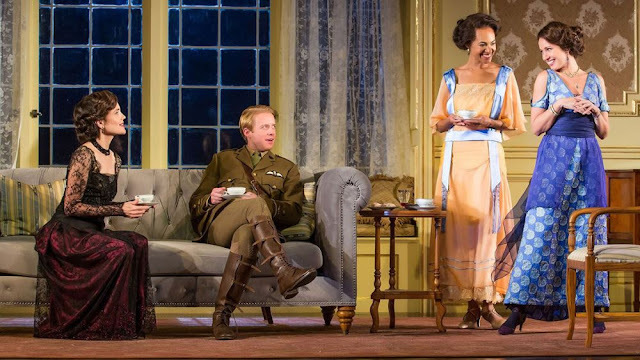 At the end of act one, Carol sits on a sofa in the Conways’ drawing room as the set recedes upstage, where a scrim drops in front of it and a new set – the same room nineteen years later – replaces it. It’s a marvelous piece of stagecraft that gets right at the heart of Priestley’s play, and it’s melancholy in ways that we can’t quite put a finger on (until we learn in act two that Carol has died). And it justifies Taichman’s choice not to take an intermission between the first two acts. Taichman won the Tony Award for Indecent but for all her obvious skill at staging – in Time and the Conways she continually has to create stage pictures with up to all ten people in full view at the same time – she doesn’t seem to me to be in command of either style or tone, and her work with the actors is wobbly. I believe that any director who got the entire ensemble of this play working in sync could bring it off – that its other challenges would disappear. I hope that someday I get to see that production.